In a perfect world, each of your precious teeth would stay healthy, strong, and brilliantly white throughout your life. The truth is, however, that most New Hampshire men and women will need to restore a tooth at some point. A tooth can be compromised by tooth decay, enamel erosion, a chip or crack, gum disease, or injury. Sometimes old restorations break and need to be replaced or root canals performed decades ago develop an abscess. Bonding, officially called direct composite veneers, is used to repair minor cosmetic problems – small chips, cracks, discoloration, and spaces between teeth. A skilled cosmetic dentist applies moldable tooth-colored composite resin and shapes as desired. The resin is then cured with a special light to harden and adhere tightly to the tooth. Composite bonding is commonly the most cost-effective option for improving healthy teeth with minor cosmetic issues. Porcelain veneers are wafer-thin tooth-shaped fronts that are permanently bonded to your natural teeth. They are used when the underlying tooth is structurally sound and free of tooth decay. A beautiful veneer can cover a chip or crack or correct the alignment of a tooth that appears slightly off kilter as compared to surrounding teeth. Modern white fillings are strong and inconspicuous. A minimally invasive filling at Vanguard Dental Group leaves you with more of nature’s ideal dental material — your own enamel and dentin. We can also replace old amalgam fillings with white fillings. This makes your teeth look a lot better every time you open your mouth. Get rid of all that metal! A traditional filling is shaped and molded after it is applied to the tooth. Because inlays and onlays are produced in a dental lab, they are frequently called indirect fillings. A less invasive inlay or onlay may be used instead of a traditional filling or, in some cases, a crown. Inlays are applied to just the center of the biting surface of a tooth (not to a cusp or point) and are usually smaller than onlays. An onlay restores one or more cusps of a tooth. A crown replaces the entire visible portion of the tooth, restoring appearance, durability, and function. A crown is typically needed for a tooth that has had a root canal, a tooth with extreme decay, or as the replacement tooth in a dental bridge. Attaching a crown to the abutment is the final step of a tooth implant procedure. Crowns can be made of all metal (such as gold), porcelain-fused-to-metal, all ceramic, or all resin. Gum recession puts teeth and underlying bone at risk. Soft tissue grafting can cover the exposed root of a tooth to restrict further damage. Gum surgery is also handled for cosmetic reasons such reshaping a gumline to eliminate a “gummy” smile. What if a tooth has to be extracted because it is beyond saving? For many Vanguard Dental Group patients, a dental implant anchored into the bone is the optimal solution. A tooth implant consist of a strong metal post (artificial root), abutment (connecting piece), and beautiful crown. A dental implant had many advantages over a dental bridge. They are stronger, provide virtually natural function, prohibit bone recession, and do not impact the surrounding teeth. For patients with several missing teeth, tailor-made implant-anchored dentures can be developed in any configuration required. For more specifics about any of these procedures, call Vanguard Dental Group at 603-435-1482. 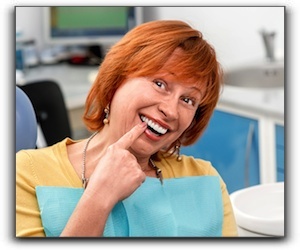 Thanks for visiting the Vanguard Dental Group blog. We appreciate your interest in our Derry dental practice.